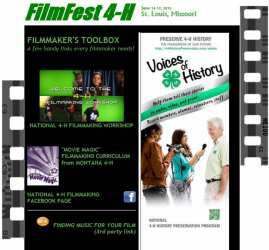 The fifth annual “FilmFest 4-H” takes place June 14- 17, in St. Louis, Missouri. Workshops include such topics as prop creation, life as a working actor in Hollywood, improvisation techniques, production success, and much more. Previous years presenters have included the editor of the ABC television series Nashville, a makeup artist from the Star Trek series, an Emmy-winning photojournalist, the extras casting director from Hannah Montana: The Movie, cinematographers working with National Geographic and the Outdoor Channel, and many others. Participants also have the opportunity to “take a meeting” with the presenters, visiting one-on-one to ask questions and received personalized advice. Equally exciting is the chance to connect with new friends from across the country, who share their technical and artistic interests. “FilmFest 4-H” also features screenings of films made by teen filmmakers, many of whom attend the event. Categories for films this year are Narrative, Animation, Documentary, Promotional and “Voices of 4-H History.” Prizes are awarded to the top films in each category, and the deadline for submissions is May 15, 2015. The 4-H History Preservation Team is again sponsoring the “Voices of 4-H History” Category. The costs to attend FilmFest 4-H include an all access pass ($119) for each teen and one chaperone, and a hotel room ($119/night at the conference rate). Finally, lunches are provided on Monday and Tuesday as part of the event, but participants are on their own for breakfasts and dinners.